Wheeler, Lorraine ~ Passed away peacefully at OakvilleTrafalgarHospital on Sunday February 7, 2016. 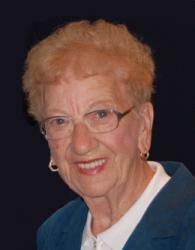 Lorraine (Jones) Wheeler in her 93rd year. Dear mother of Sherry Wheeler (Michel) of Victoria, BC, Velda Wheeler of Cochrane, AB, Jim Wheeler of Burlington, Kelvin Wheeler (Emer) of Toronto. Sadly missed by her grandchildren Amanda (Devon), Ken, and Clare. Predeceased by her brothers Harvey, Cyril, and Israel and her son Kenneth. Friends may call at the GILCHRIST CHAPEL – McIntyre & Wilkie Funeral Home, One Delhi Street, Guelph, Ont. (from 10:30am – 11:30am Wednesday) Funeral Service will follow in the chapel at 11:30, Wednesday February 10, 2016. Interment at Memory Gardens. Memorial contributions to the Canadian Cancer Society would be appreciated. We invite you to leave your condolences and donations online.